African Butterfly Fish (Pantodon buchholzi) are uniquely interesting predator species common to many lakes throughout West Africa. Tropical fish keeping enthusiasts have been housing butterfly fish for over 90 years, but they have never been available in large numbers. Butterfly fish are surface dwellers and spend most of their lives on or near the water’s surface foraging for other surface dwellers and insects that fall into the water. They have large eyes that sit high on their heads and a very large upturned mouth like their distant cousins the Arowanas. They will usually ignore mid water and bottom dwelling fish unless they venture to close to the surface. Butterfly fish will eat almost anything they can fit into their mouths, but with a few exceptions are a good community fish. African Butterfly fish are strange looking, yet strikingly beautiful fish. Their gossamer looking pectoral fins resemble a butterfly’s wings, hence the name and they have a dark brown to black body, speckled with lighter brown to black coloration that give them a camouflage appearance. Butterfly fish are jumpers and should be provided a large well planted tank of at least 30 gallons that with some open areas free of vegetation and some sparse floating plants. Plants that reach almost to the water surface will provide them with places to hide and make them less likely to jump. A tight fitting cover is a must for these fish to stop them from jumping out of your tank. 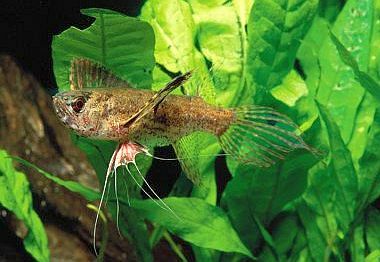 African Butterfly fish do best in soft, slightly acidic, tannin stained water at about 80 degrees F. You can place peat bags in a box or a canister filter to achieve the desired results or add driftwood to your tank. Butterfly fish eagerly accept flake foods and some floating pellets, but being carnivorous they prefer live foods (crickets in particular), freeze dried or frozen floating foods. They have been known to eat small tetras that get too close to the surface. To breed African Butterfly fish, lower the water level in the aquarium to a couple of inches for a few weeks. Then re-fill the aquarium using soft acidic water. Males will climb on top of the female at the water’s surface to spawn and after about a day, the eggs will turn dark and float back to the surface. It’s best to remove the eggs to a separate aquarium with the same water until they hatch. The eggs will normally hatch in two days at which time you can feed the fry baby brine shrimp, daphnia or any other small live foods. Feed adult African Butterfly fish a steady diet of crickets, flies, brine shrimp, insects, freeze dried foods or flake foods to keep them healthy.